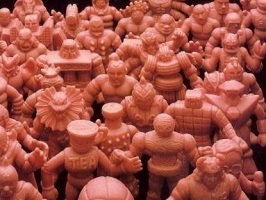 Lucas Rage is the King of Counterfeit M.U.S.C.L.E. figures. He has almost singlehandedly built the Art 100 archive known as the 233 Counterfeit Collection. Within hours of the request, he had photographed and sent along 28 new counterfeit figures to add to the collection. These additional 28 figures put the entire 233 Counterfeit Collection at 88% complete. If you have a counterfeit version (not a custom) of any of the remaining 26 figures, then please snap a quick picture and email them to uofmuscle@gmail.com. This entry was posted on Thursday, March 14th, 2013 and is filed under Research, Sociology, UofM News. You can follow any responses to this entry through RSS 2.0. You can skip to the end and leave a response. Pinging is currently not allowed.